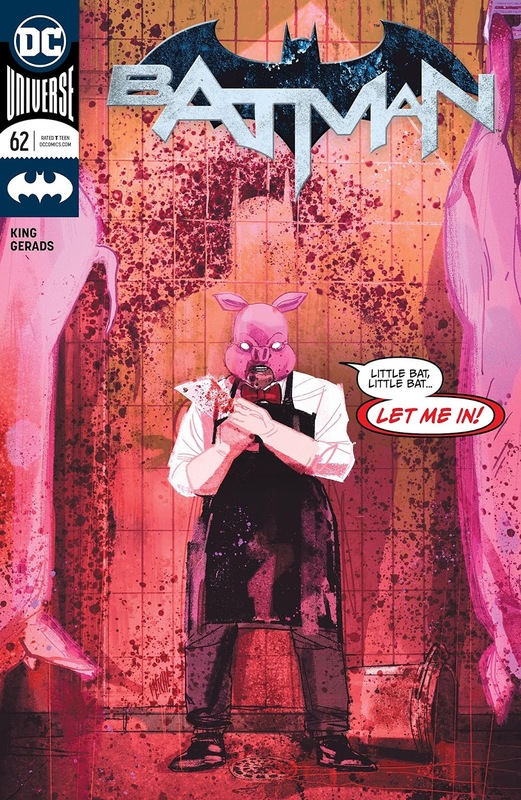 There once was a villain named Pyg, who was happy with whatever he did. But then, one day, his world, turned grey, when he found out that his wife wore a wig. Want to know more? 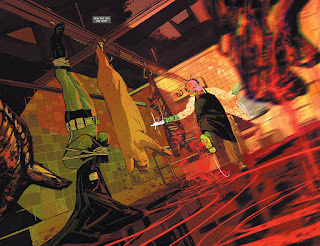 Then please ignore the following adventure created by Tom King, Mitch Gerads, Travis Moore, and published by DC Comics in January, 2019. TO QUOTE Carl Sagan: 'It is far better to grasp the universe as it really is than to persist in delusion, however satisfying and reassuring'. Do you think Batman would be able to investigate the death of his own parents? I do, to some degree, because I presume he’d be able to cope with his emotional turmoil and act accordingly. For a start, he’d question all of the witnesses (Bruce Wayne); then he’d interrogate all of the suspects (criminals, thieves, and gangsters), before finally capturing the culprit and sending them off to prison! Part One) JUST IMAGINE: Now, as some of you may know, I haven’t always enjoyed 'Tom King’s version of Batman', as he normally depicts him as being an overemotional brute who acts quicker than he can think (due to his recent split with Selina Kyle). Last month, for instance, he wrote two stories that centered on Batman punching his way through Bane, Maxie Zeus, Kite Man, and even Jim Gordon. Then a month before that, Batman took on the KGBeast and an army of masked hoods. So, as you can see, Tom seems to prefer constructing his stories so Batman has to rely on violence to win the day, rather than focusing his energies on investigating, detecting, and outsmarting his opponents with his wide-array of knowledge. That said, however, Tom's writing ability is also something I slightly admire. Not only because he’s willing to introduce new concepts, ideas, and attitudes to the Bat-Universe, but in addition to this, he’s also brave enough to delve into different genres of story by placating them within Bruce’s domain. For example, since he’s taken over this title, we’ve seen a love affair between Batman and Catwoman (which didn’t work), we’ve seen a 'down to earth' version of the Bat-Family (which was fun), and we’ve seen new superpowered beings (Gotham Girl), foreign missions (Suicide Squad), and time-travel stories (Booster Gold) that aren’t usually featured in this brand of book. 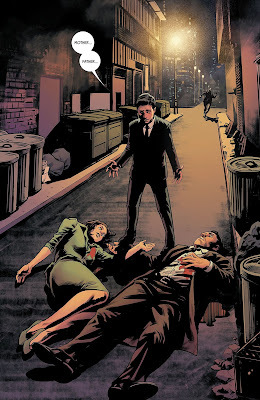 Case in point, in issue 61, the first part of the Knightmares saga, Tom presents us with a psychological scenario we all know can’t be true (Batman investigating the death of his own parents), yet we still find it irresistible to explore because it’s a strong and intriguing idea. In many ways, it reminded me of one of those imaginary stories written in the 1950s. Although, in this instance, instead of the big twist at the end being a small green alien from the planet Mars, it’s -- SPOILER ALERT -- Matthew, the crazy kid Tom and Travis first introduced us to in issue 38. The same Matthew who thinks he’s Bruce Wayne, for real, and wants to murder the people that supposedly killed his parents, even though he did it himself. So, with that said, I have to ask myself, did I enjoy this strange revelation or not? Well, if truth be told, no, not really, because I felt that it made the entire story feel a little bit disposable -- tonally, at least -- even though I did enjoy the journey and the artwork provided by Travis Moore. Here, take a look at some of the pictures provided, and see for yourself how each of his visuals are clear, crisp, and nicely composed, thus giving this adventure some much-needed gravitas and style in order to make it feel ‘more real’ than it actually was. Part Two) BOOOO: Come to think of it, I can say exactly the same thing about issue 62! After all, it did provide us with a confusing conclusion and a lot of impressive looking artwork. 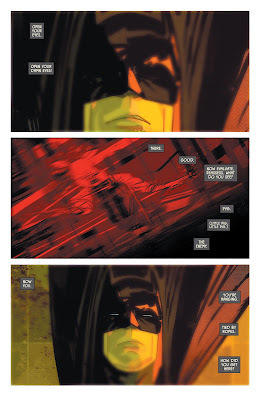 Or to be more specific about it, artwork which was far more avant-garde by design, thanks to Mitch Gerads illustrative talents, and possessed an atmospheric, almost ethereal quality that’s generally better suited to a psychological thriller -- stark, foreboding, and occasionally messy in places. In a strange way, Mitch's style of art, along with the rest of this issue, kind of reminded me of another Batman story DC published in 1988. Namely, 'The Cult', written by Jim Starlin and drawn by Bernie Wrightson, which likewise featured a Neolithic color palette, a fractured voice-over narration, and a basic premise where Batman had to fight his way out of an over-oppressive situation. Although, in this particular instance, the mastermind behind the situation was Professor Pyg, not Deacon Blackfire, whereas the situation itself was a bizarre form of intervention, not a power-play to take over Gotham City. Well, without giving too much away, in very broad terms issue 62 was largely focused on Batman trying to figure out how Pyg was able to capture, torture, and tie him up, while also trying to get himself out of this said-same-situation. Which he does, in a manner of speaking, and reminds me why I wasn't too keen on reading this issue! The conclusion. The conclusion was weird, off kilter, and felt fairly elusive and jarring at the same time. So much so, in fact, that I had to re-read it a couple of times just in case I might have missed something along the way. But no, no I didn’t. The conclusion was deliberately designed to not make much sense -- not totally, anyway -- because Pyg wasn’t Pyg, but rather, somebody else. Somebody who thinks that it's a good idea to torture Bruce in order to suppress his emotional demeanor. I mean, seriously? Is this supposed to be a new form of therapy now? Stabbing and torturing someone so they can get over a lost love? I hope not, I sincerely do. Otherwise, psychiatrists all across the globe will beat their patients back into ‘health’ instead of administering a more socially acceptable form of treatment. What do you think, dear reader? Did you enjoy this ending? Or like me, wasn’t it your cup of tea? I personally think it gave off the wrong message -- ethically, at least -- and just like the previous issue, was constructed to confuse us rather than entertain us. Which, in a roundabout way, kind of brings us back to what I said near the start of my review: Tom is willing to delve into different genres of story and then placate them within Bruce’s domain. However, this doesn’t always work out. Not in my opinion, anyway. So what do you think? Please let me know in the comment section below. The one thing both of these issues have in common is that they revolve around delusional people who think one thing, even when the complete opposite is true. So, with that in mind, I think it would be a pretty good idea to compare these books to the mental disorder, schizophrenia. To find out more, please click here. Freddy Krueger: From the horror film, ‘A Nightmare on Elm Street’. Damian Lewis: From the HBO series, ‘Band of Brothers’. Freddie Mercury: From the 70's rock group, ‘Queen’. Damien Thorn: From another horror film, ‘The Omen’. Freddy Freeman: From the original ‘Captain Marvel’ comic book. Damien Rice: From the 90's rock group, ‘Juniper’. Freddie Prinze Junior: From yet another horror film, ‘I Know What You Did Last Summer’. Damian Wayne: From his mother's woo-woo!